In the heart of Seattle’s international district, aka China Town, there is an Asian grocery store called Uwajimaya. They specialize in importing food from China, the Philippines, Japan and other countries on the Asian continent. During convention season though, (which is all year round in Seattle. ), it becomes geek Mecca. The reason it becomes a destination of choice because of our obsession with Japan and it’s culture. It is hugely popular amongst our kind because of anime, manga and video games. Uwajimaya doesn’t just have food, it also has an attached book store with an endless supply of manga and knick-knacks. Either way, if you have never been to Uwajimaya go and GO NOW. It’s fun just to walk around and look at all interesting food from other countries. The drink isle is liquid weird. 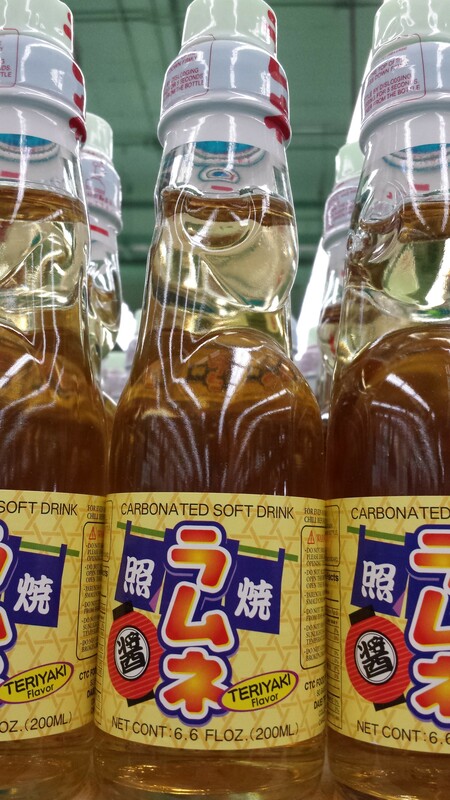 For example most people are familiar with the Japanese soft drink Ramune. 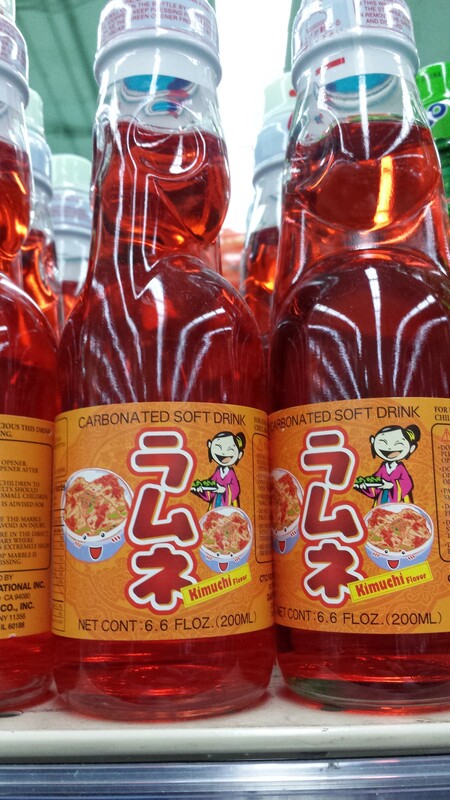 The flavors we get most places in the United States are normal like melon, strawberry and their generic Ramune. The regular flavor takes like the candy smarties. Lately we’ve been lucky enough to get some of the more interesting flavors. The first one we tried was curry flavor. The curry flavor is initially sweet with a spicy aftertaste. It’s not till the after taste that you recognize the curry flavor. Out of all the nontraditional flavors, I could actually drink this on a regular basis. I love it. The other flavors we have tried are not so good. They must be an acquired taste. There is a kim-chee flavor. I LOVE KOREAN food. Kim-chee is awesome. This drink is terrible though. The flavor is spicy chased with a musky flavor of feet. Kane tried this as well and agreed. There was burning and then BLARGH! They have a Teriyaki flavor, that is actually good. 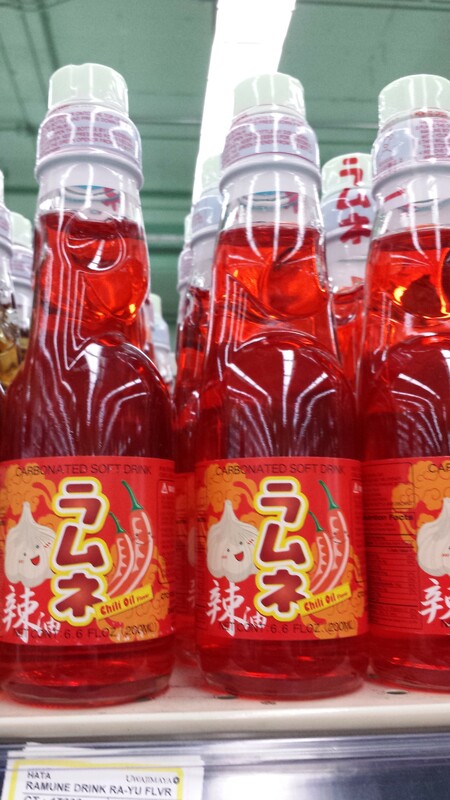 The flavor of teriyaki is balanced with the sweetness of the base Ramune drink. It tastes a little like maple syrup as a soda but with undercurrents that are hard to explain. There was a flavor they had but the season has passed, Takoyaki. Takoyaki is a breaded octopus ball. They are delicious dipped in Cupie mayo and Unagi sauce. The drink version was just wrong. The sweet balanced with salty and the octopus flavor was gross. This was the only flavor we have poured out without finishing. 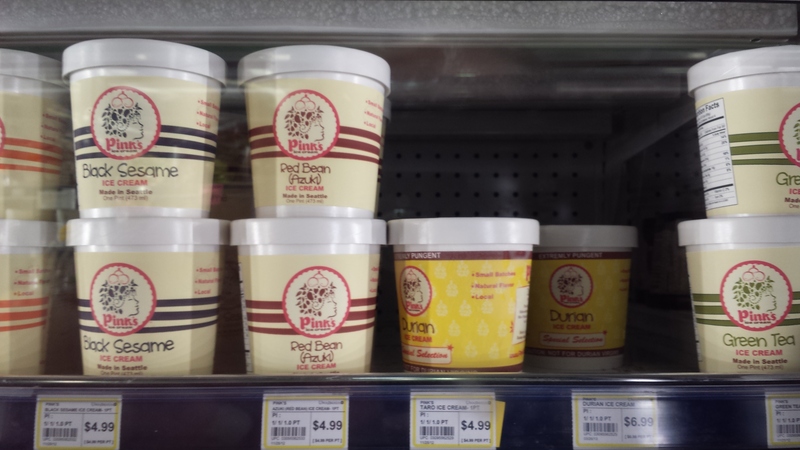 There are a few flavors I haven’t tried yet, Ginsing, Garlic, Lychee and Chili. I’ve seen online they have watermelon, yuzu, plum and wasabi flavors. I want to try the wasabi flavored one so badly. 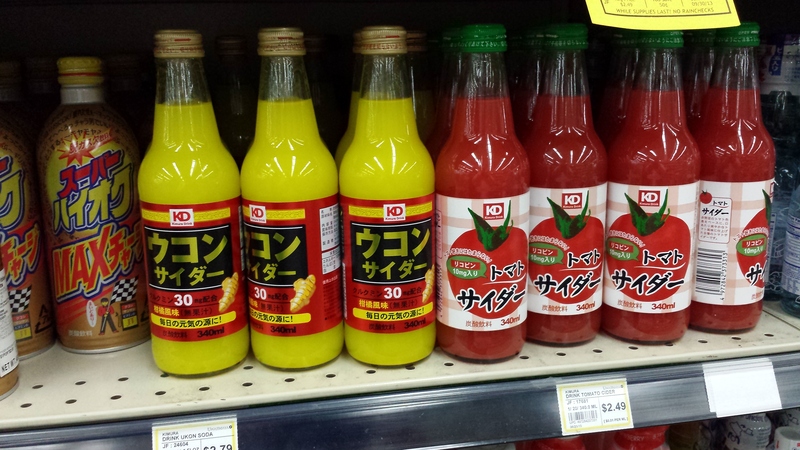 While looking at the current soda selection, I also found a different brand that included Tomato flavored soda and an alternate curry flavored soda. Next time I head over to Uwajimaya I am picking these two up. 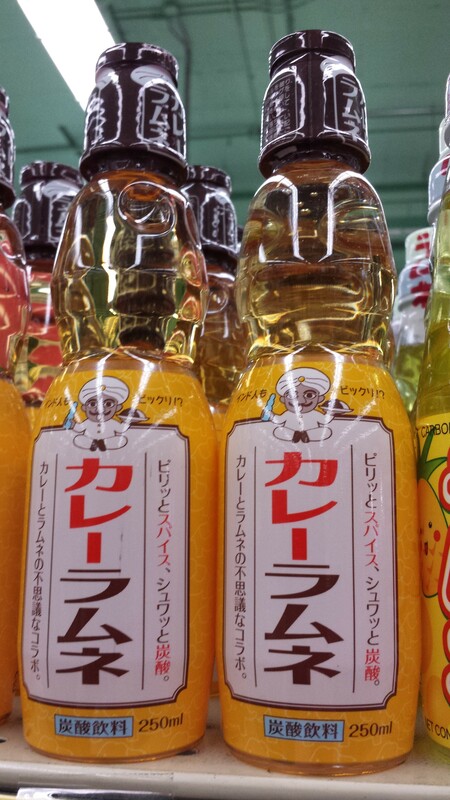 This is the Curry Drink now. It used to have a different label. 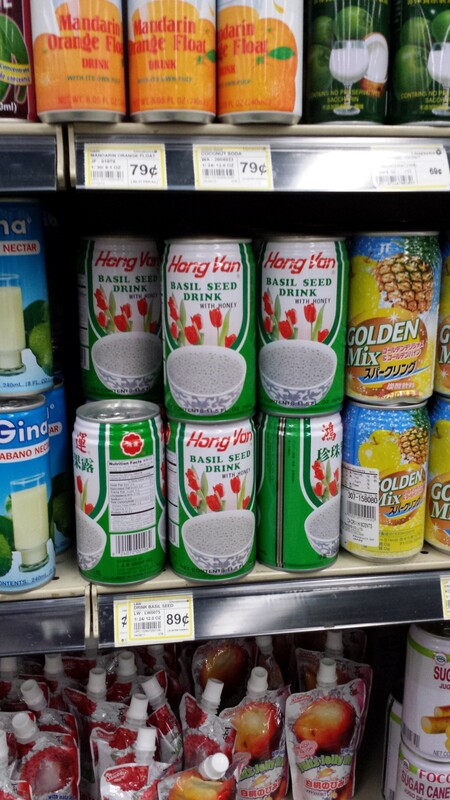 In the same isle as the soda, they have the various other drinks mostly juice based. 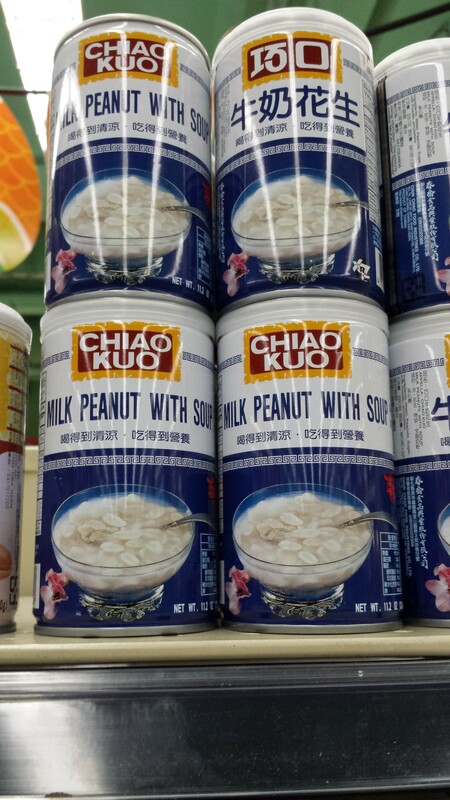 There are a number of strange drinks like peanut milk. I have not tried this one myself but we have friends that swear it’s delicious. Yes, there are actually peanuts in the drink. There is a basil seed drink that has gelatinous little basil seeds. 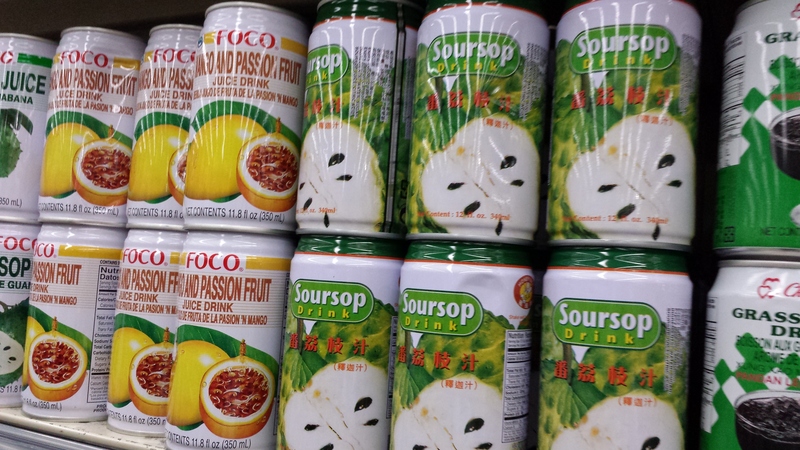 They have Soursop drink, which I haven’t tried. In parts of Asia Soursop is used to fight cancer. They have a variety of drinks made with aloe. They used to have a Calpico flavor in aloe that I loved but it’s not being imported anymore. 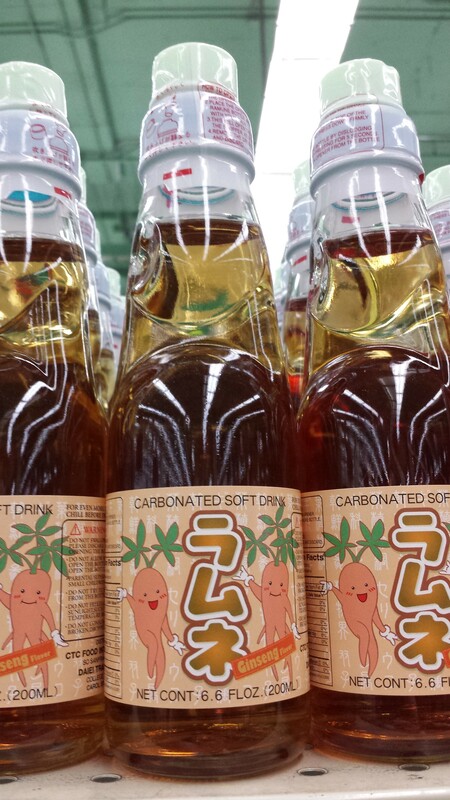 You will find other drinks though that are either flavored with or have chunks of aloe floating in them. I recommend them. They are sweet and the texture is actually not slimy. I really expected chunks of aloe to be slimy. 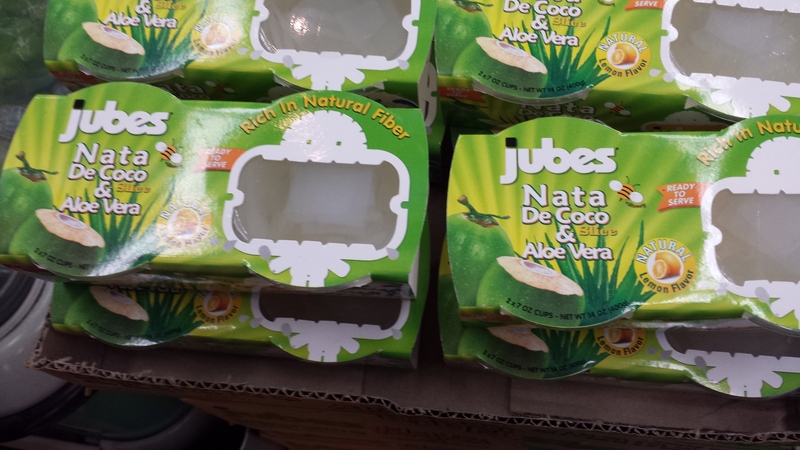 Near the ice cream isle I found these containers that had aloe and cocoa. I am curious, but I haven’t tried it yet. I love aloe drinks though. These have to be like the little jelly cups that have chunks of lychee. Japanese ice cream flavors are pretty delicious and strange at the same time. I love taro flavored anything first of all. Taro is a root that turns purple when you cook it or blend it. 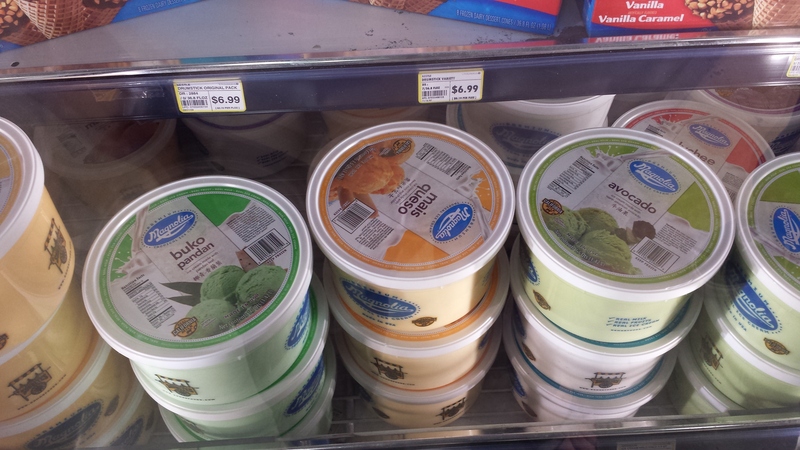 They also have avacado flavored ice cream. Everyone thinks avacado will be a gross flavor but it tastes sweet and delicious. If you don’t think you will like, get a an avacado bubble tea. The flavor comes out creamy and sweet. 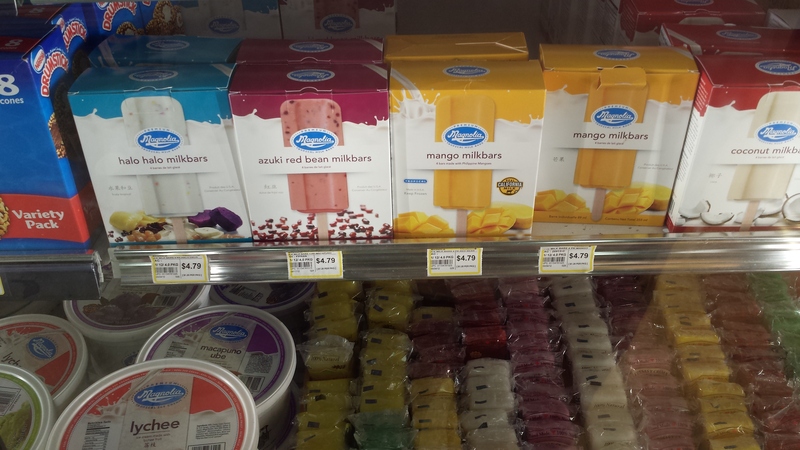 Some of the flavors that I haven’t tried are the cheese and queso flavor. That is my new conquest. In the popsicles they have a red bean flavor. I’ve actually tried a red bean bubble tea and I didn’t enjoy it. I find the flavor and texture distasteful. The most horrifying flavor for anything is durian flavored. Durian, aka jack fruit, tastes like rotten onions or gasoline. In parts of the world you are not allowed to bring durian on a plane because of the pervasive smell. Kane and I have tried durian flavored wafers and pudding. This stuff is disgusting. Although, it is a delicacy in some parts of the world. Scientists posit that some people like it because of the taste bud receptors. I just don’t know. Both times we were left with an after taste of onions and chemical burn. Avoid it unless you were raised with this fruit. If you don’t know anything about Japanese snacks start off slow. Go to the candy isle and get some Pocky. These are bready snacks dipped in chocolate and strawberry. There are season flavors, like right now there are cheesecake flavored Pocky. If you are looking for a salty snack, try shrimp chips. I love them. They are sweet and salty at the same time. They have a consistency similar to Funions. They sound gross but are delicious and addictive. Everyone has encountered wasabi peas at some point, well they also have sriracha peas. I really don’t know which is better. They are delicious and burny in different ways. In the bread section there are these delicious pastries that are buns. They are called pan. My favorite are melon pan, which are simply melon flavored buns. They have a variety, like cheese, chocolate, vanilla, mocha and green bean. Melon Pan are my favorite though. Give yourself a treat, walk the isles of Uwajimaya. Find something interesting and give it a try. You will find yourself enjoying lotus root, dried fishes and pocky in no time. P.S. 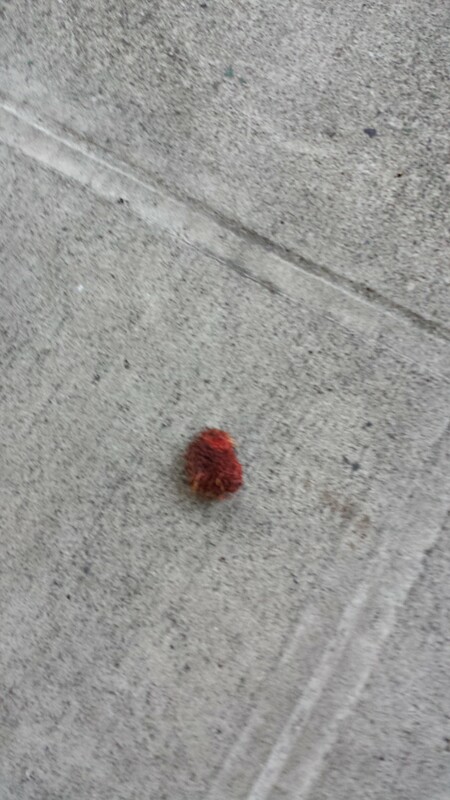 On our way out we found a lychee just laying on the sidewalk.